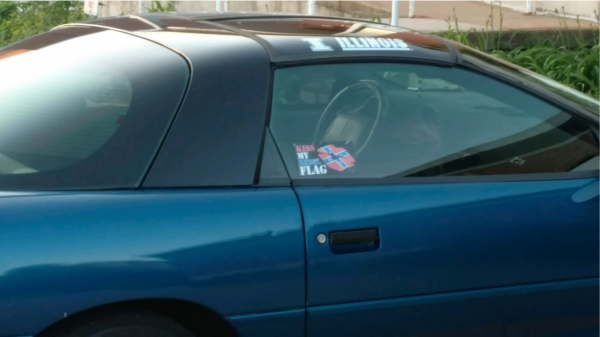 A photo from the court documents of a vehicle with a confederate flag parked in an employee parking lot on the University of Illinois Urbana campus. A plaintiff in the lawsuit reported the vehicle and the photo to the department in charge of investigating racial harassment complaints. The plaintiff said he was never informed of an investigation occurring as a result of his complaint. On The 21st: A group of black employees have filed a class action lawsuit against the University of Illinois. They say they face regular racial harassment while on the job. And, for tens of thousands of Americans, living with sickle-cell disease can be excruciatingly painful and even deadly. Now, new gene therapy advancements have given a handful of patients hope for a symptom free life, and even a cure. Plus, have you seen the movie Green Book? It talks about sundown towns in the South, but it’s something that was actually a bigger issue for black citizens in Illinois. A group of black employees have filed a class action lawsuit against the University of Illinois. The plaintiffs say that they are regularly harassed at work by both colleagues and supervisors and, subject to racist and threatening language. Ultimately, the plaintiffs say that the University of Illinois is violating both federal and state law by allowing this to happen and, that racial harassment is “standard operating procedure” on the Urbana campus. We reached out to the U of I for comment on this. So far they’ve said they haven’t yet fully reviewed this particular lawsuit and cannot comment. Jesse Centrella is the associate representing the plaintiffs in this case. He joined us on the line. Lee Gaines also joined us. She's the education reporter for WILL and the Illinois Newsroom. "We'd like for proper oversight of the how the University deals with instances of racial harassment," says Jesse Centrella who's an attorney with Friedman and Houlding. An estimated 100,000 people in the U.S. are living with sickle-cell-disease. The single cell mutation behind this disease can cause excruciating pain, strokes, and can lead to an early death. Even though scientists have known the cause, there hasn’t been truly effective treatment. As it is, patients can undergo expensive bone marrow transplants or monthly blood transfusions, but few other options exist. But now, new experimental gene therapy has given a handful of patients hope for a symptom free life- and even hope for a cure. Leuteresa Roberts’ son, Brandon Williams is one of these patients. Leuteresa and her 21 year-old son live in Chicago, and she joined us on the line. Also on the line we had Dr. Alexis Thompson, who is the head of Hematology for Lurie Children’s Hospital in Chicago. And, Gina Kolata, senior medical writer for the New York Times. Her reporting inspired this conversation. Before this experimental treatment, 21 yo Brandon Williams had suffered four strokes by age 18. The damage made it hard for him to speak. His older sister died of sickle-cell disease. Now... his symptoms are gone. After the Civil War and Reconstruction, white Southerners took action to restrict the rights of black men, women, and families. Today most of us know them as Jim Crow laws. And these laws were in many ways a backlash to the abolition of slavery. Well, according to historian and scholar James W. Loewen, another kind of backlash was happening in the north. Sundown towns. Places where black citizens were not only barred from living in, but where they wouldn’t be safe if they stayed in town after dark. This is also one part of the movie “Green Book” which came out last fall. But Jim has been writing about this for years. His 2005 book Sundown Towns: A Hidden Dimension of American Racism is one of the few scholarly works on this topic. He’s originally from Decatur and is now professor emeritus of sociology at the University of Vermont. Historian Jim Loewen grew up in Decatur, but he didn't realize that many of the all-white small towns around IL's biggest cities had pushed black residents out after the 1890s.